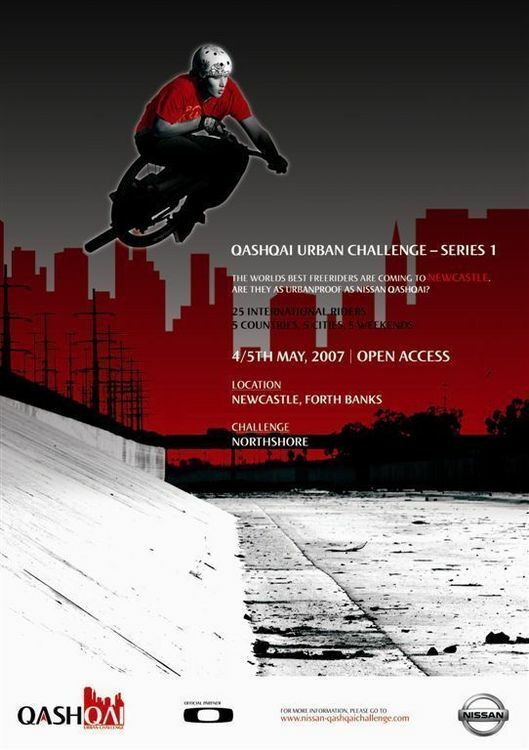 Only one week to go before the first event of the Qashqai Urban Challenge. Course builders are getting ready and the riders are busy preparing for a tour that will test the limits of mountain bike freeriding. Trying to get a hold of them these days is not easy, but Cameron McCaul and Trond Hansen gave us a couple of minutes while they were attending the season openings of the biking world. Just a couple of days until the first freeride tour ever will start in Newcastle (UK). Everybody is preparing themselves for a tour all over Europe. Of course these two riders themselves will also be guys to look out for at the Qashqai Urban Challenge, as they are some of the top riders in the world as well. Everyone seems well prepared for an urban battle between the worlds’ top riders through the European metropolises which is supported by Vans, Swatch, Oakley, and Dakine. Ne, sorry. Da bist Du bereits besser informiert.